Even though designers and product teams talk about Agile principles all the time, most teams still don’t leverage them effectively. When we end up spending time and money making something that nobody wants to use, how do we finally make a break to radically improve our product development process? The following case study explores how, by integrating Lean UX principles as the foundation of Agile methodology, the product team reduced waste and optimized the product process. Our product team was working to solve the problem of lunchtime coordination at work. As the lunch break begins to approach, employees get distracted, spending a lot of time deciding what they want their meal to be, where they want to eat it, and who they want to share it with. We decided to make a digital lunch assistant app that would help make this easier for them. We began with user research by interviewing companies and gathered enough data to start working on a solution—or, at least, so we thought. By the time we had a product up and running well enough to test internally, we began to doubt we had covered all of the use cases from our prospective market. The potential users we had talked to all worked under similar conditions, were from the same location, with the same number of nearby restaurants and expected delivery time. However, before launching, we realized we needed to validate business assumptions and include more target groups into our product research. 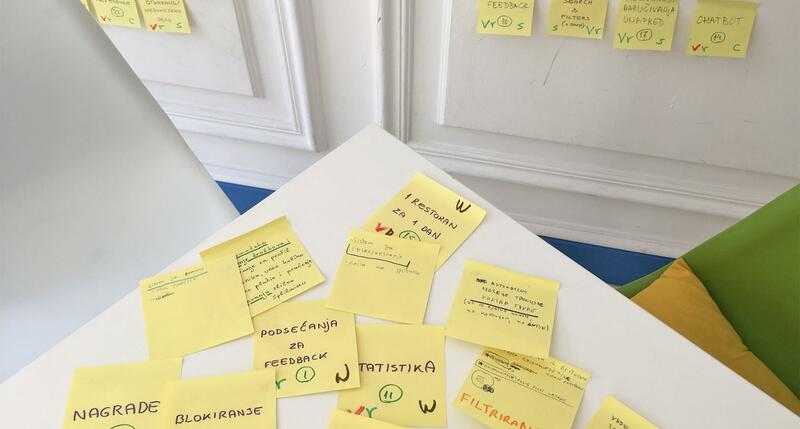 After conducting user research interviews with 30 representatives from different IT firms across the city, we realized that while a similar problem existed at other companies, our solution was not aligned with the habits of a broader audience. The product we had been developing up to that moment did not account for users with differing proximity to restaurants, ordering and payment preferences, etc. 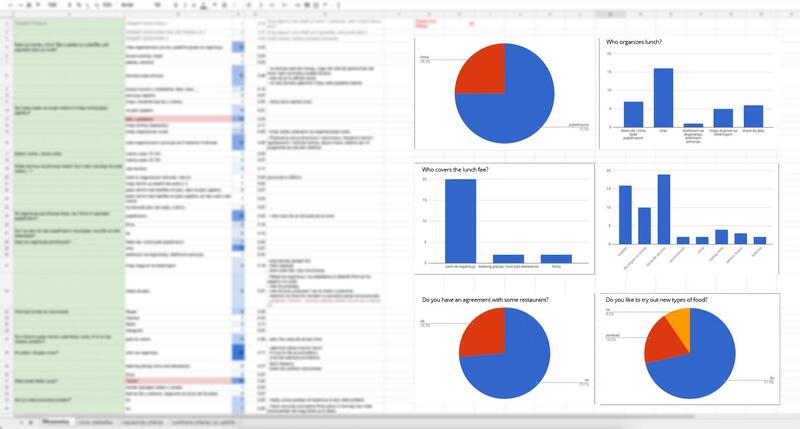 The results of user interviews are presented in the form of spreadsheets and pie charts for easier understanding and further discussion within the team. When designing products, it’s essential to know exactly what needs to be validated and how many different users are needed for valid results. Yet, like many product teams, we had gotten excited about early validations and jumped on a solution before gathering enough information about additional facets the problem might have. Once we realized we had missed critical data early in the product development process, we needed to shift rapidly. Never a joyride, I had to present new user research findings to a team that had spent months developing a solution that was about to be discarded. How to convince the higher-ups to abandon that product and agree to pursue a completely new solution. How to avoid making the team lose motivation and feel like they had wasted months of work on something that we should have researched better in the beginning. How to make sure to validate our product ideas thoroughly to be sure we’re on the right track. How to speed up the process and make sure everybody is on the same page with rapidly approaching delivery deadlines. After accepting that we had not properly validated our earlier product idea, it was critical we reconsider our approach. We decided to adapt the method Jeff Gothelf explains in his book Lean UX. Lean UX is an approach to the design process that moves design teams away from producing loads of documentation in favor of iterative validation and leveraging user feedback. The process focuses on three main phases: build, measure, and learn. The Lean UX framework advises involving as many contributors and stakeholders as possible to get a diversity of perspectives and ideas for the product solution. This means including everyone from designers, product/business owners, and project and marketing managers to programmers in the design process. 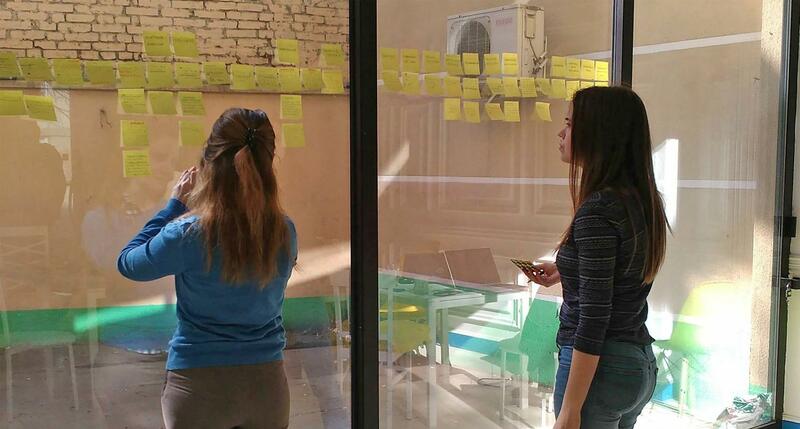 Lean UX calls for the whole team to be involved in the problem-solving and product validation process. Lean UX encourages the team to move faster and more efficiently by time-boxing the process. To maximize the efficiency of the exercise, consult Parkinson’s Law and limit the time frame for each phase to produce positive pressure and speed. The team agreed to reserve five working days for the process, leaving the last day for testing scheduled with a group of potential early adopters. That commitment forced us to have something to show and test after four days. Based on our particular project and the team’s needs, we made a few adjustments to the method described in Jeff Gothelf’s Lean UX. For a more detailed description of how to use the same method with your team, please consult the book. Lean UX provides a framework for generating solutions to problems and validating them. Step 1: Collect and analyze data. First, we analyzed previously conducted user interviews and presented what we flagged as main user pain points. Each of the team members wrote their own hypothesis to answer the main product and business questions from the book’s worksheets. 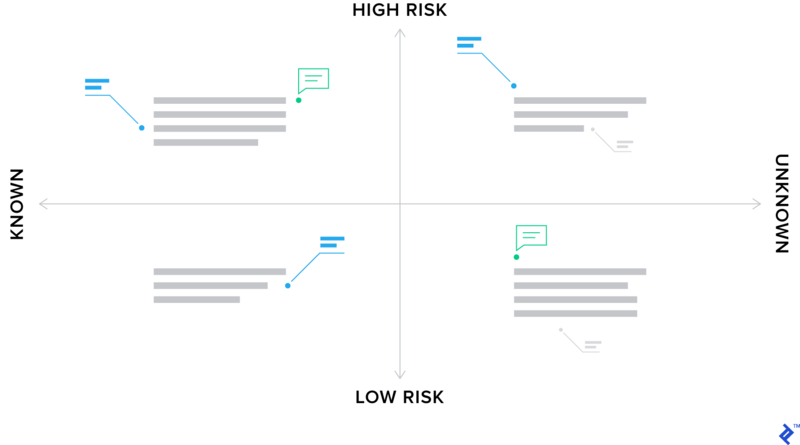 We then discussed everyone’s ideas and mapped them on a matrix that compared the size of risk those assumptions bring to the business, to how much we really knew about them. 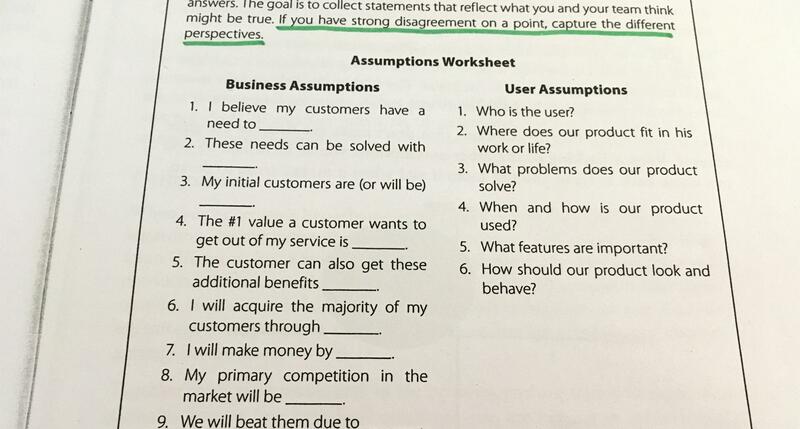 The team used worksheets like this one from the Lean UX book in order to articulate the problems and solutions they were imagining. Step 3: Envision a validation plan. We made a plan of how to validate each hypothesis—what we wanted to measure, what metrics we would track, and what results would mean they had been validated successfully. We created personas based on the previous user interviews. It’s very important to not only trust your own expertise but also to know who you’re building your product for and to always design with the end user in mind. Developing user personas helps ensure the solution meets the user's particular needs, not just the intuition of the designers. Step 5: Prioritize features based on the value they provide. All team members then give an agreed-upon number of points to features they consider most important. Features given the most points are designated as highest priority. The entire team should participate in figuring out how to prioritize solutions and features based on how they solve the central problem. Step 6: Everyone sketches ideas. All team members had to sketch their own solutions, then present them and get feedback. Good ideas don’t come from designers exclusively—it’s important to include everybody in the process in order to make sure you’re not missing out on some great proposals. 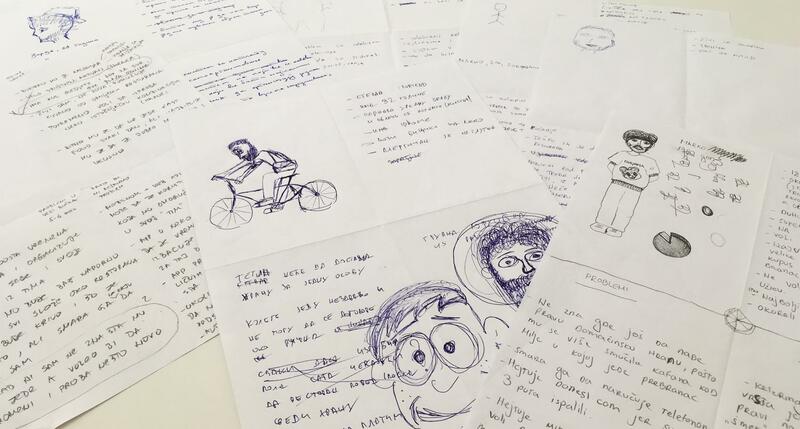 Regardless of drawing ability, everyone in the team should participate in sketching solutions and presenting them to the rest of the team for feedback. Step 7: Refine the solution and test it. We critiqued sketches together and decided on the optimal solution. Then we created low-fidelity wireframes and put them together in a simple MVP that we could show to users and test whether our new idea made sense at all. On the last day, we scheduled user testing with potential clients. The whole team conducted the testing in pairs: one interviewing and the other writing notes. This was very important in order for the whole team to hear reactions to their solution offering different perspectives than may have been anticipated. 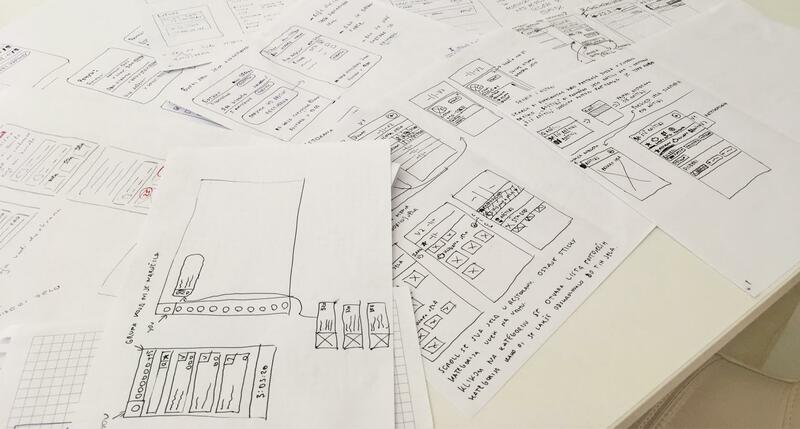 We showed the testers wireframes on a mobile phone and asked them to mimic tapping around, explain what they wanted to achieve, and share their thoughts along the way. Even if our solution did not meet our users’ needs successfully during testing, we would still have gained valuable feedback and insight into what new direction to take our product. Happily, the potential early adopters we tested with were excited about our solution. Documentation of the user testing and collected feedback. 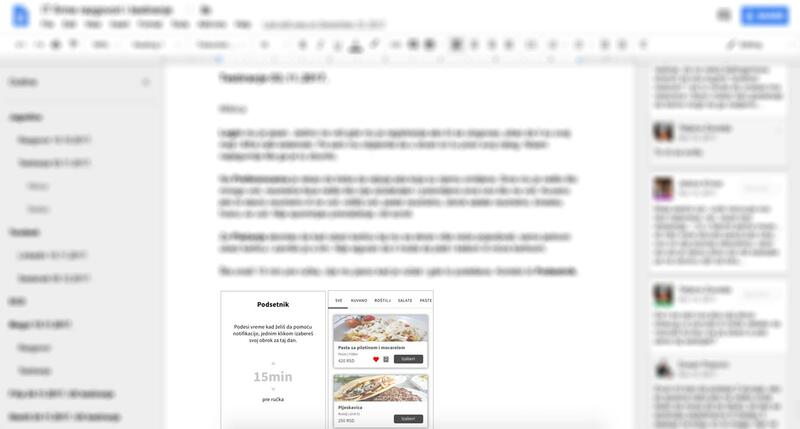 Google document comments are used for further discussion on improvements and easy collaboration (image blurred due to confidentiality). The experiment was a success, and we decided to include Lean UX methodology in the company’s regular processes going forward. Throughout the product testing process, we sent the participating team members frequent surveys to gauge their reactions—the feedback was consistently positive. The team trusted the Lean UX method and felt confident that it was guiding us in the right direction. If you care about what you’re doing and realize things could be better, take the responsibility of introducing the necessary changes and ensure the improvements grow roots in company culture. Bringing Lean UX principles into your product development processes can make your team more efficient and improve your products. Adapt and tailor the framework to your team’s specific needs and dynamics. At the end of the day, we all have the same goal within the company, even if perspectives on how to achieve it are different. If your job is to create a product that users will love and the business will benefit from, then you may have to first create the working conditions in which you and your team can accomplish this. What does Lean UX mean? Lean UX is a user-centered design framework for collaboration and iterative validation during the design process. By focusing on user research and feedback over excessive documentation, Lean UX helps teams build products people actually need. What is UX in Agile? Agile involves quick design sprints as part of the UX design process. Lean UX principles are the foundation of design within the Agile product development process. UX methodology describes the UX design workflow and processes by which designers design experiences for users. UX methodology includes various phases in the UX process and design workflow including user research and validation. What is a UX framework? A UX framework is a way to define an overall approach to user experience design. Lean UX design is one such framework for product teams to incorporate iterative validation into their UX workflow. This is very impressive. The fact that you bring in sketches/ideas from everyone in the group regardless of drawing ability shows a deeper level of respect for The Idea. Thanks, Miguel! Many team members had some great points of view and what's also amazing is that when you realize some of your colleagues think alike you feel deeper connection and understand.